Hey everyone! So the first product I'll be reviewing from my Influenster Love VoxBox is the Gillette Venus & Razor! -Price: Retails for $8.99- $10.99. Packages of three replacement cartridges are available for about $14.99 - $19.49. -My thoughts: At first I was a bit nervous because I have sensitive skin and the box says that you do not need shaving cream and because it has 5 blades. Let me tell you, I am IN LOVE with this razor! All you need to do is wet the razor to "activate" the Olay moisture bars and it shaves like a dream! It leaves your legs sooooooo silky and I didn't need lotion after! I did not get razor burn or cuts! If you haven't tried this, go out and buy one because it is definitely worth you money! -Venus’ five-bladed razors shave you close and adjust to women’s curves for a smooth and comfortable shave, even over tricky shaving areas like knees and ankles. -Olay Moisture Bars contain skin-enhancing elements found in Olay products: Petrolatum helps lock in skin’s moisture for less dryness and Glycerin helps offer that goddess glow! Just wet the razor to release a light lather – no separate shave cream required. 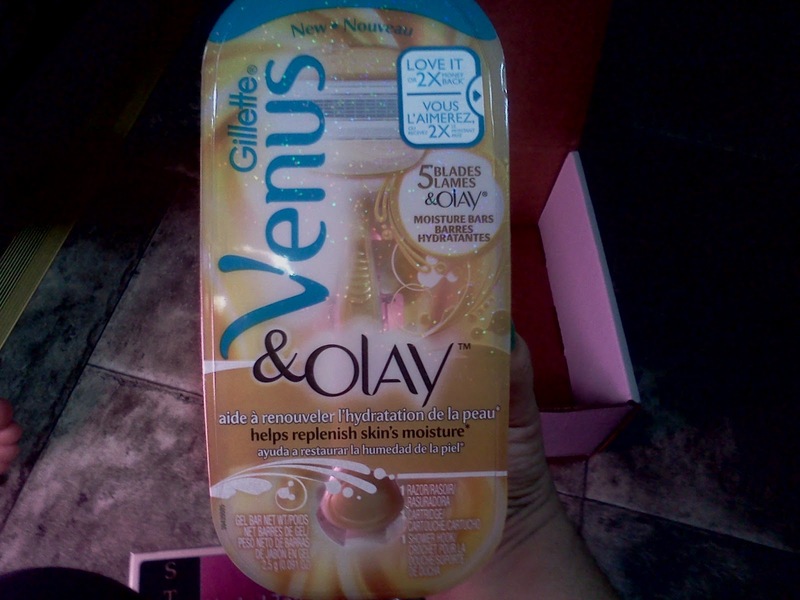 -Venus & Olay will be available starting March 15, 2012 at food, drug, convenience and mass merchandise stores throughout the United States. I did not get razor burn or cuts! If you haven't tried this, go out and buy one because it is definitely worth you money!